One of the year’s strongest open tournaments began Saturday on the Isle of Man. A huge prize fund of 144k british pounds and no doubt at least a million euros budget considering the number and quality of top GMs invited. 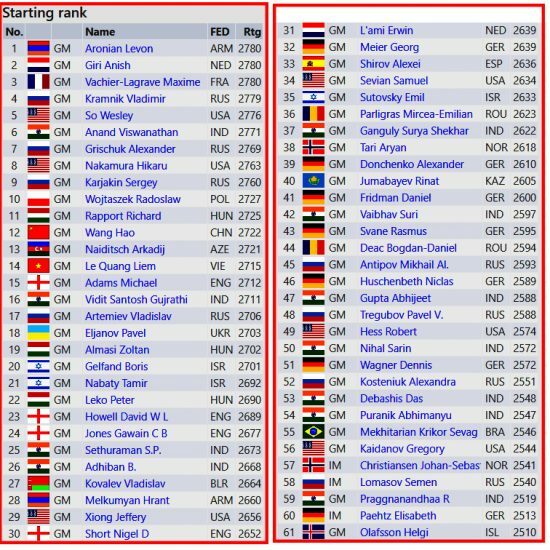 The tournament boasts 165 players from 37 countries, of which 145 have FIDE titles, including 80 grandmasters. As we can see from the above graphic, the organizers wanted the event to be top-heavy, and they surely succeeded. Only Carlsen and Caruana are missing from the list of participants, and that is probably because they are busy preparing for their World Championship match in London next month. This year’s tournament has the rather awkward official name ‘Chess.Com Isle of Man International’, but the chief sponsor must be the Scheinberg family, today apparently exiled to the Isle of Man. You can read some of the intrigue related to the one time owners of PokerStars HERE. I just assume that Chess.Com is allowing its name to be used for the event without actually making any direct or indirect financial contribution. Of course, I may be wrong, but the official website for the tournament is deliberately vague and unhelpful with respect to such details. That being said, Peter Doggers & Company (as I like to refer to the Chess.Com social media gang) are competently taking care of commentary, online presentation and what not. All the information you need for watching this tournament online can be found HERE. Of course, numerous other websites that offer online services can also be found with a simple Google search, or by taking a look at the side bar on the right. The tournament is 9 rounds long and will finish next Sunday. White to play and win material. Black has a strong attack. In the game he continued imprecisely with 21…Bf2 (22.Rh3!). Instead, Black has a clear way to win. How? As is normal in most open tournaments, the 1st round often witnesses some very unusual pairings. Fortunately. I say this because it often leads to entertaining and instructive games such as this one. Ditto the previous commentary. Here Nigel shows that becoming a politician has not been detrimental to his chess. Really instructive play by Karjakin, who prefers to slowly torture and strangle his opponent rather than blitz her off the board. Very different from Karjakin’s win, here Gelfand plays a complicated and wild game. At one point, it seems to me, White forgot to resign. A reasonable fight by Black, but what can one do against Grischuk? He plays so well. Saudi link to downed Russian airliner? Previous story Today’s winning Girl Next Door!